Growing up in underprivileged homes, Rick and Lupe are acquainted with the many challenges that underprivileged families face. Rick, born in the United States, is a third generation Mexican American. Rick’s parents earned their living by working as migrant farm workers and also in hotel services. At the age of eighteen, Rick had already learned the value of hard work as he became self-supporting and was no longer dependent on his parents. Lupe, born in Cuba, immigrated to the United States at the age of five along with both of her parents and her younger brother. Lupe and her family arrived in the U.S. unable to speak English. 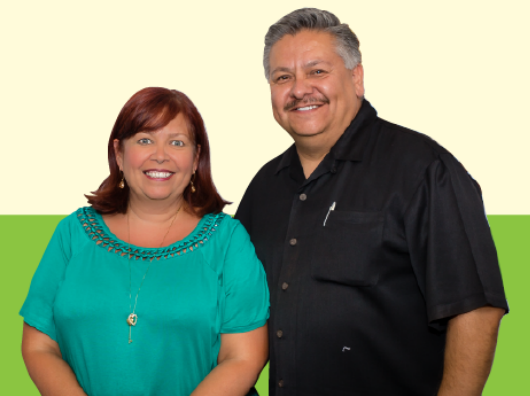 Lupe’s family risked everything attempting to seek a better life in the U.S.
Over the past three decades, Rick and Lupe have formed numerous businesses and companies. These very successful businesses and companies are key to Rick’s and Lupe’s visions and life’s work. Rick and Lupe are blessed and their remarkable success has enabled them to pass many blessings to their 7 children and 8 grandchildren. In today’s society, we are faced with unprecedented challenges. The concept of raising a family with “good old fashioned” core values of God, country and family can sometimes seem overwhelming. It is Rick’s and Lupe’s vision to leave a legacy that they were used by God to help make a difference wherever and whenever they can. Rick and Lupe strongly believe that in order to accomplish this goal, you must have good solid roots and a strong foundation… similar to a LIVING TREE! Never before has the need been greater to assist those who are in need. You might be a single Mom who is trying to further your education in order to guarantee a better paying job to support your children. You might be a homeless person or perhaps you are part of a family that needs shelter and clothing. You might be Combat Veteran who is an amputee that can benefit from a therapy dog but cannot afford it. You see, it doesn’t matter to Rick and Lupe who or what you are. Living Tree Foundation” offers and provides help for the people that are in need one life at a time…"